Ever Wondered what it would be like if Geometry Wars had Zombies in it? Check out my review and see what I thought about Zombie Apocalypse. 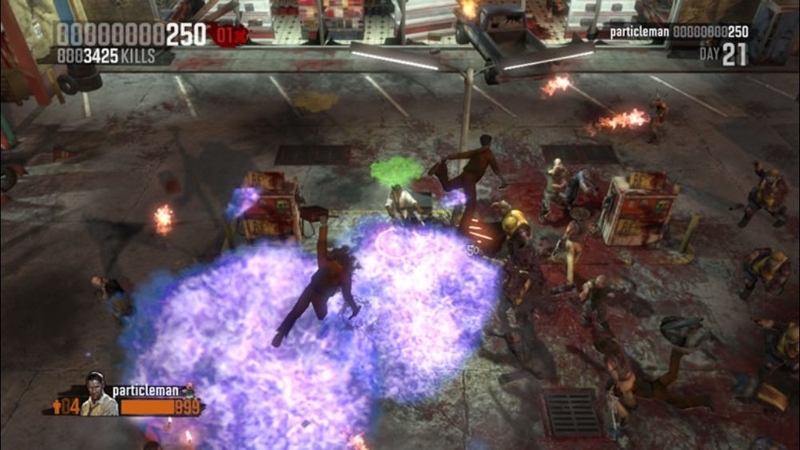 Zombie Apocalypse is a twin stick shooter for Xbox Live Arcade that incorporates the elements that we would expect from a twin stick shooter: Precision is key, racking up points is fun, and multiplayer is a nice addition to the game. 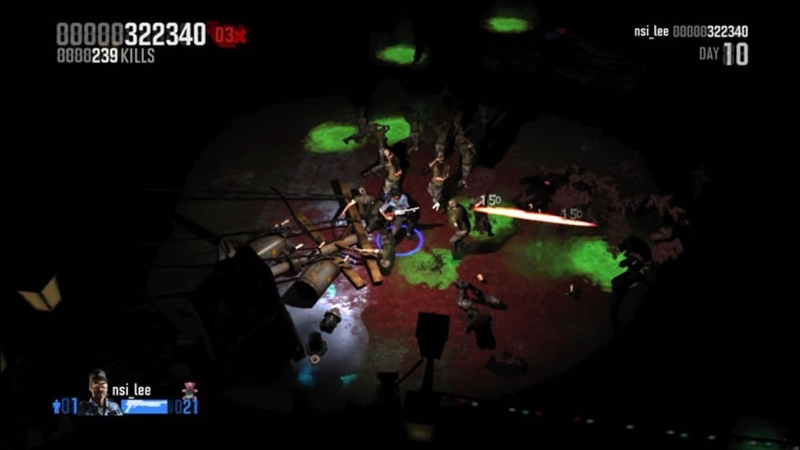 Besides using the left and right analog sticks to move and shoot, Zombie Apocalypse also uses the triggers to control a chainsaw, and the bumpers throw zombie bait to attract the zombies to a location preferably away from you. Hilarity ensues when this occurs, because the bait is a talking teddy bear that says things like "I'm, Full of Love...and C4!" It only has a few lines, but every time I hear it, it always makes me laugh. The Basic goal of the game is to last 55 days against the horde of zombies you will face, with some days being chainsaw only, or some where the lights are turned out except for your flashlight while you frantically move around the area. Don't expect a new location every day in the game either, because there are only about 10 environments that rotate with nothing changing in their layout. 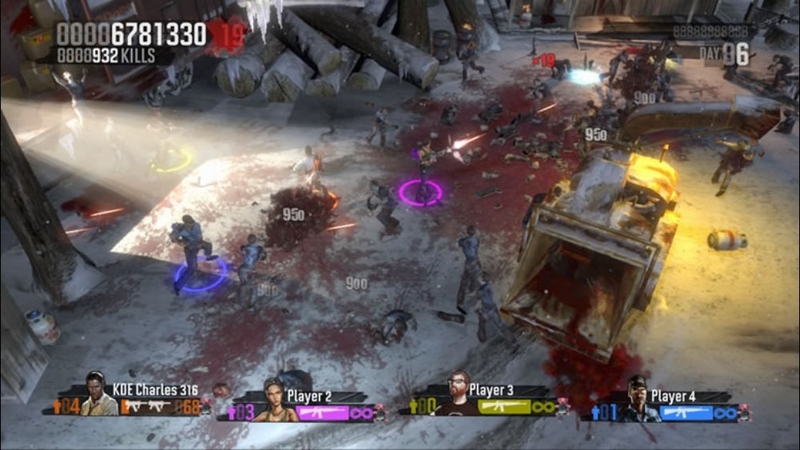 Each level has unique traps and hazards for you to utilize, but you'll mostly depend on your default assault rifle and random weapon pickups to get you through the game. Nihilistic Software, who developed the game, must have played Left 4 Dead, because it's inspiration is all over this game in my opinion. There are 4 survivors to choose from: Three guys and One girl, and three of the four reminded me instantly of Bill, Zoey, and Louis. Plus there are special infected zombies that get introduced throughout the game. These zombies are different from the ones in Left 4 Dead, but a few have similar abilities that may remind you of Valve's undead shooter. This is not a bad thing, because just killing the typical zombie type for the in-game 55 days would get boring really fast. 800 Microsoft Points or 10 bucks is a good price for a full and simple game to me, and if you're unsure it is, check out the demo which does a good job of showing you what to expect. Overall It is a fun Arcade game, and Zombie and Twin Stick shooter fans should give it a look.